This Sign Supply is the Ideal Sidewalk Display! Wholesale Company Sells Sign Supplies for Vinyl Banners! Where to Buy Sign Supplies in Bulk! 21-1/2"w x 8"h header area perfect for larger, attention-grabbing text. 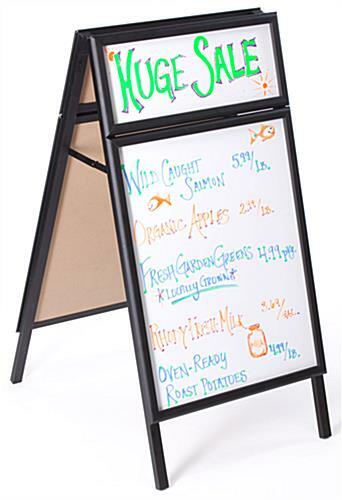 Menu board includes protective lenses to help prevent tampering. 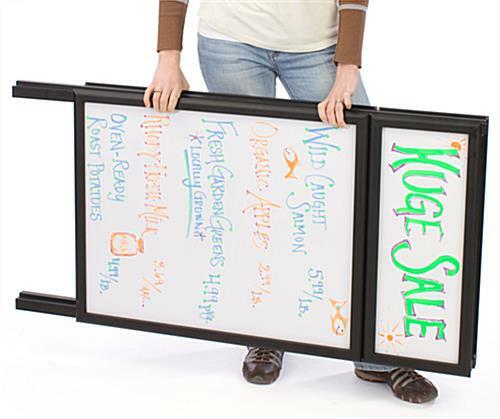 Dual-sided white board 22" x 28" display advertises from two directions simultaneously. Black polished aluminum snap frames allow for quick sign changes. 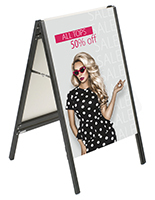 This sign supply, also called a sidewalk sign and sandwich board, is a write-on advertising aid that features two lens-covered sections on each side of the sign. The lenses ensure your message is not disturbed when displayed in an area that is not regularly attended. These lenses also help to protect the sign surface from inclement weather. This sandwich board, sign supply is made with side hinges that collapse down to make it easy to carry and store the sign. 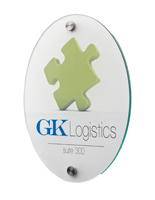 This inexpensive sign supply has a snap-open frame that keeps the protective lens in place. Snap open frames make it easy to access the writing surface to make changes to the message content. Buy wholesale sign supplies today to create the ideal outdoor display for your business! This sign supply has white, write-on surfaces. 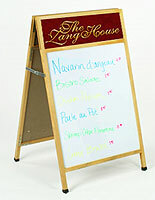 Designed for use with wet-erase markers or chalk, this sign supply allows for daily customization of your message. 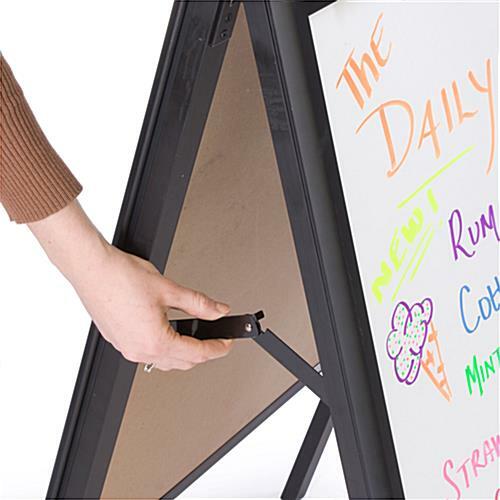 The wet-erase markers have a bolder look than standard dry-erase markers and are harder to remove from the white board surface making it difficult for passersby to tamper with an unprotected message. However, the message erases nicely with a damp cloth. This sign supply has two (2) write-on sections per side. The upper area is the header. The lower area is for the main message. The header area measures 21-1/2" x 8" and is ideal for larger letters to grab attention, while the lower area measures 21-1/2" x 27-1/2". This commercial sign supply on sale here is a very practical, easy to use sign that will bring customers into your business. Please Note: Although these aluminum sign supplies are used mainly for outdoor sidewalk advertising and the aluminum frame resists rust, there are some limitations! The gloss black writing surface has a wood-based substrate. It can withstand many rain showers; but as true with any wood-based product, if left permanently exposed to rain and weather (not brought indoors during extreme conditions) it will, over time, experience some bowing, warping, and delaminating. However, customers have experienced many years of use when they bring the sign supply indoors during days of extreme rain or snow. 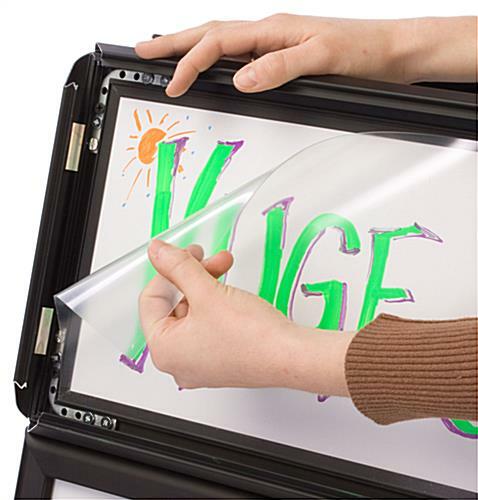 This board can only be used with Neon/Fluorescent Wet-Erase Markers. It is not made for Dry Erase Markers. Erase writing easily with a damp cloth. 18.0" x 45.0" x 30.0"